The brainchild of Santa Cruz painter Janice Serilla and friends, she titled it the “1st Annual Masters of Santa Cruz Art Show,” chose the first theme and began inviting more artists. From the get-go, it was lighthearted and inclusive. They located a lovely venue: the newly renovated tasting room at Stockwell Cellars in Westside Santa Cruz and set the opening for November. In the meantime I was wondering how to translate my artistic response into clay and was tending towards a large (for me) narrative sculpture detailing the theft of the Mona Lisa from The Louvre in Paris in 1911. It’s fascinating to read about with both the poet Guillaume Apollinaire and painter Pablo Picasso being accused of the heist. (Neither did it.) La Joconde, as the French call her, was missing for over two years and returned to The Louvre in 1914. Always a loved painting, with the theft she became a world-wide icon. Today she sits in a climate-controlled, bullet-proof glassed display behind a wide railing and the experience of viewing her is not as intimate as it was in 1911. My sculptural idea involved complicated portraits of both Apollinaire and Picasso as well as the Italian who did take her, Vincenzo Peruggia, but there would be NO Mona, just the empty place on the wall with the four iron pegs that were left behind. With about a month to go I had an epiphany about the venue: a tasting room is NOT a gallery! Therefore, I shouldn’t make a sculpture which needed a pedestal and would be vulnerable to the elbows knocking back a flight of reds. 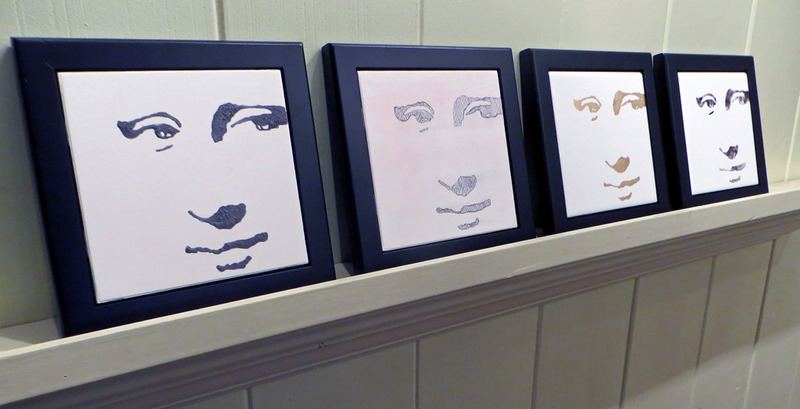 Be like the painters and make a wall piece! 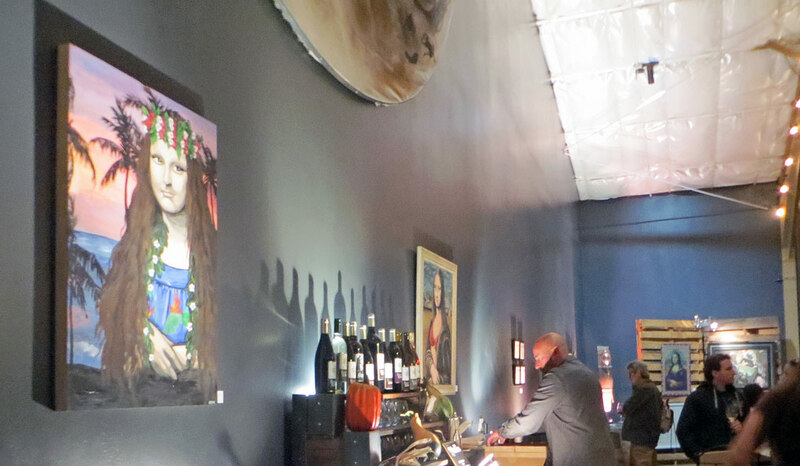 Here’s a sweet shot of the wall behind the bar during the opening reception. Left to right we have works by Allie Gripenstraw, Janice Serilla, then my four tiles and a couple of other pieces straight back. The rest of the works were displayed all around the walls of the cavernous space and dramatically lit to great effect. Late in the reception we found the Selfie Photobooth by the racks of barrels. It featured Leonardo’s landscape as a backdrop and props for sitters to don (shoulder drape and long dark wig) with a gilt frame to hold up and complete the photo. Sadly, all my quick shots of folks having fun with this feature were maddeningly blurry in the low light. Maybe if you imagine an older man with a snowy white beard in that long dark wig holding the frame, you will have a fun mental image of the possibilities. And, it turns out, I was not the only artist taken with the 1911 theft! 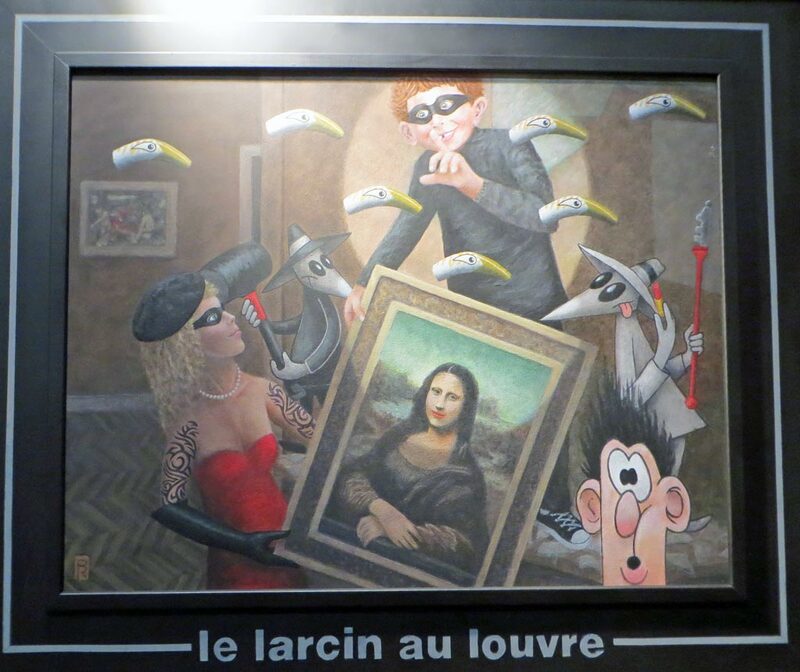 In closing I give you Bob Rogers’ wonderfully imaginative work Le Larcin au Louvre. –Liz Crain, who is looking forward to this being an annual event. Any suggestions for next year’s theme? The Thinker? The Girl With the Pearl Earring? Monet’s waterlilies? What about abstract? Mondrian? DeKooning? Hockney? So many possibilities!